Quesadillas make a great meal for hectic weeknight evenings. 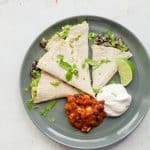 The mashed avocado in these quesadillas give them an ooey, gooey texture, even if you choose to make these dairy-free and leave out the cheese! Spray a large skillet with the cooking spray and heat over medium-low heat. Add in one of the tortillas. Spread the avocado evenly over the tortilla, top with the black beans and the cheese. Add in the remaining tortilla on top and press down to seal. Cook for 3-5 minutes, or until the underside of the tortilla begins to brown. Carefully flip the quesadilla, and cook for an additional 3-5 minutes, until heated through and brown on the underside. Transfer to a cutting board, let rest for 5 minutes, then slice into eight wedges. Serve with salsa and sour cream. If you don’t have time to make your seasoned black beans from scratch, you can also buy them from a can in the grocery store. Check out the brands in the international foods aisles for the best flavor.